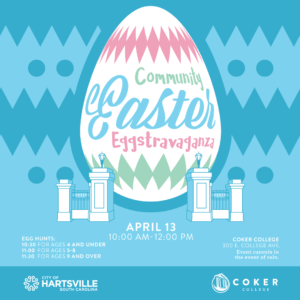 On Saturday, April 13th, at 10 a.m., the City of Hartsville and Coker College will host the Community Easter Eggstravaganza, at Coker College’s Davidson Hall lawn located at 300 East College Avenue. This free event will feature more than 13,000 eggs stuffed with candy and toys, Hartsville youth ages 12 and under are invited to participate in three separate egg hunts at different times divided by age group. The first round will be for children ages 4 and under, beginning at 10:30 a.m., the second round for ages 5 to 8, starting at 11 a.m., and the third round for children ages 9 to 12. Children are asked to bring their own baskets, but a limited number of collection bags for eggs will be available at the event for those in need. Families can also enjoy food vendors, music, face painting, and other kid-friendly activities. This event will be the first event planned by the City’s new Special Event Coordinator, Samantha Martrano, who began her new position in February. Martrano is a native of Hartsville and says “she is very excited to give back to the city that she grew up in by planning events for all ages.” Her office is located in the Key to Your Hartsville at 106 East Carolina Avenue and her responsibilities include planning special events, coordinating rentals of Lawton Park and The Edition, and managing The Key to Your Hartsville. Parking is available in all City and Coker College public parking lots. For a campus map of Coker College, visit coker.edu/campus-map. Pushing, shoving, or knocking down of participants will not be tolerated. Any instances will result in immediate removal of the egg hunt. Parents or guardians should supervise their children at all times during the event. This event will be cancelled in the event of rain.